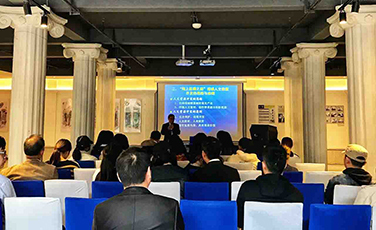 the seminar "Lecture on the Maritime Silk Road Culture and Development of Movie Works" was held in Ningbo Laowaitan International Talents CommunityLee House. The lecture invited Prof. Zhao Yuzhong from Beijing Film Academy as main speaker. 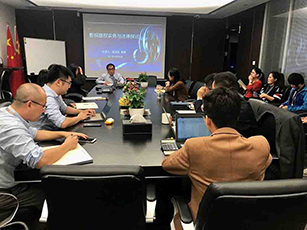 Many important guests from related industries attended, such as Ningbo Copyright Association, Ningbo cultural and creative Enterprises, Film and TV Industry Enterprises, Law firms. Mr. Yu Zegang, a senior partner of Zhejiang Harnest & Garner Law Firm, presided over this seminar. Professor Zhao Yuzhong is a teacher at Beijing Film Academy, a member of China Film Association, director of China Copyright Association, director of CHINA LAW ASSOCIATION ON SCIENCE &TECHNOLOGY, evaluation experts of Humanities and Social Sciences research project of Ministry of Education, evaluation experts of National Social Science Fund Art project of the Ministry of Culture, member of National Expert Group on Intellectual Copyright Strategy. He has published monographs such as Introduction to Culture Market, General Theory of Law in Cultural Industry, Culture Market Theory and Contractual Practices in Cultural Industry Management and so on. In his 2013 proposal for building the “One Belt One Road” initiative, Professor Zhao researched the human resources of important port cities along the "Maritime Silk Road", focusing on the cultural sites and cultural resources in Ningbo and proposed the development of his idea. About the development of human resources in port cities along the "Maritime Silk Road", Professor Zhao believes that it could be successful to focus on cruise tourism industry and relying on humanistic material, to create theatre and TV dramas. At the same time, he wants to pay attention to the protection and development of cultural resources, focus on the essential contents and commercial value. After the lecture, lawyers, representatives of cultural and creative enterprises, representatives of film and television industry asked some questions to Professor Zhao. The main contents of the questions were: once the cultural and creative enterprises have prospered, how can we achieve excellence? Any suggestions for plots’ creators to streamline the contents? How to treat the phenomenon of adaptation on the basis of original intellectual property rights? Professor Zhao combined the film and television works such as "Wolf 2";"Tai" and "The Finding of An Army" to analyze the elements of success of literary works and new themes.